The Jutland peninsula and its 400 surrounding islands form one of Europe’s smallest countries. Denmark has an abundance of picturesque villages and towns, historic castles and monuments, and a coastline which varies delightfully from broad sandy beaches to small coves and gentle fjords. Throughout the country, rolling hills and gentle valleys provide a constant succession of attractive views; there are cool and shady forests of beech trees, extensive areas of heathland, a beautiful lake district, sand dunes and white cliffs resembling those of Dover; nor should one forget the Danish islands, each of which has its own unique attractions. The Danes have taken strong measures to keep their coastline clean and tidy, keen for visitors to sample the many unspoilt beaches. Inland from the 4,800km (3,000 miles) of white-sand beaches and unspoiled islands, you’ll find a landscape eminently suitable for cycling. Sleepy villages clustered around whitewashed churches occupy a landscape of heather moors, rolling hills and rich farmland dotted with windmills and thatched farmhouses. Ferries ply between the mainland and the islands, competing with awesome bridges like the 16km (10 miles) resund link to Sweden. Amidst such tranquility, it now almost seems surreal to consider that this country once spawned a seafaring race of people, the Viking Warriors, feared throughout northwestern Europe. 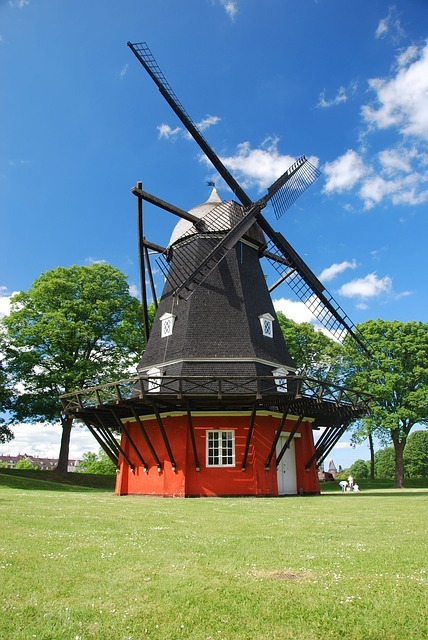 Today, visitors to Denmark find a country that is peaceful, introspective, neutral and egalitarian. Its hallmarks are good taste, world-class design and uniformly high standards that apply equally to its accommodation and transport. Cuisine is excellent, especially in the realm of dairy products and scrumptious pastries. Add to this a people both amiable and helpful, with a facility for languages, and the result is an overwhelming sense of welcome. Denmark, in addition to its modernity, retains some of its long-lived associations with fairytales, probably consolidated by the fact that this nation produced the great story-teller, Hans Christian Andersen. 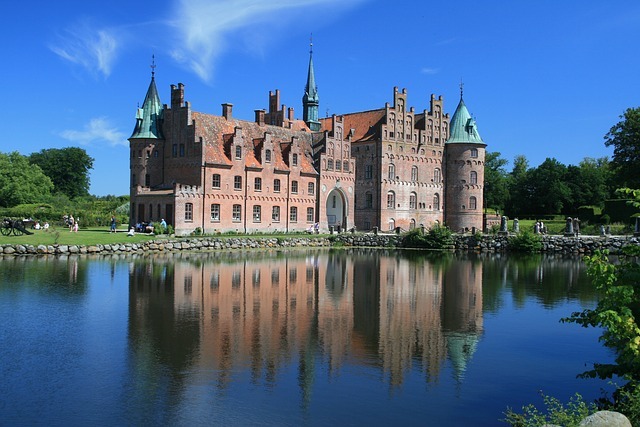 Enchanting moated castles and historical rickety buildings are still frequent sights throughout Denmark. Copenhagen is a wonderful cobblestoned city with many quaint medieval streets and buildings, but there is more to Denmark than its capital, and any visitor to the country is strongly advised to explore elsewhere too. Egeskov Castle is one of Europe’s best-preserved Renaissance island castles. Built in 1554 on a foundation of several thousand oak piles driven down into a lake, the castle is a magnificent renaissance masterpiece. The interior features beautiful period furniture, paintings and trophies. A visit to the castle is a day out in itself, sure to satisfy all the family. There is a large 36-acre park with an amazing array of gardens – the French garden, the cottage garden, and the water garden. In summer, the Fuchsia Garden boasts the largest collection of fuchsias in Europe. The car museum is also a treat, displaying about 300 antique cars. The Viking Ship Museum is located at the foot of Roskilde Fjord beside the Roskilde harbour. In 1662, five Viking ships were rescued and resurrected from the harbor. The Museum was built to house and reconstruct these vessels. All five ships are vastly different. They were built for different purposes, different waters and with different Viking builders and highlight the scope of Viking shipbuilding. The museum has now outgrown its initial role, and there are now other Nordic boats housed here. There is an artificial island next to the museum which houses archaeological workshops and educational institutions. Denmark’s mean temperature in the coldest month (February) is 0°C (32°F), and in the warmest (July) 17°C (63°F). Rain in Denmark comes on a regular basis year-round, there are no true dry periods. The annual rain fall in Denmark averages 61 cm (24 in) of precipitation. Copenhagen has an average of 170 rainy days. The greatest rainfall comes between September and November. Snow is rare. You can also take a look at the current local weather in Denmark’s cities. Shopping in Denmark is always a double-edged sword – it’s no secret the prices are high, but the quality of craftsmanship is often beyond compare. The Danish, like their Nordic compatriots, are world famous when it comes to furniture. It was out of this industry that Denmark found its defining export – the Lego block. One of the world’s premier toys for children of all ages, they are popular enough to warrant their own theme park. Outside of the furniture, some of the tops gifts made in Denmark are their wide array of ceramics. Royal Copenhagen Porcelain is one of the most famous ceramic studios in the world, but there are plenty of smaller studios scattered throughout the country, many of them producing pieces of equal, if not greater, quality. When talking about shopping in Denmark, most of your conversation will revolve around Copenhagen. As the most cosmopolitan city in Denmark, shopping Copenhagen is therefore a mishmash of styles and cultures, the best examples of Danish goods from all across the country gathered in the capital. The main shopping district is centered around Stroget, one of the most popular walkways throughout the city. Shopping Copenhagen is a bust if you pass up these streets, with their casual mixes of department stores and aged specialty shops. One thing you won’t see much of when seeking gifts made in Denmark is a lot of shopping malls – they are the exception rather than the rule, even when browsing the streets of Copenhagen. It’s diplomatic to say the city of Billund has a number of tourist attractions, but the truth of the matter is that nearly every visitor to the city comes for one reason: the Legoland Theme Park. If you have children, or grew up with Legos yourself, the trip to out of the way Billund is certainly worth it. Over 45 million of the tiny locks are utilized to make up the Legoland Theme Park, portraying scenes from all over both Denmark and the rest of the world. Seeing Amalienborg Palace, the Statue of Liberty, or a series of Rhineland castles made entirely of Legos certainly doesn’t compare with seeing the real things, but the replicas are quite impressive in their own right. Although Denmark is an EU member nation, Denmark’s citizens rejected adopting the euro in a referendum in 2000. Denmark’s own currency, the krone, is most often written with the symbol DKK in international money markets, Dkr in northern Europe and kr within Denmark. Throughout this guide we’ve used kr. One krone is divided into 100 øre. There are 25 øre, 50 øre, one krone, two kroner, five kroner, 10 kroner and 20 kroner coins. Notes come in denominations of 50, 100, 200, 500 and 1000 kroner. Citizens of the USA, Canada, Australia and New Zealand need a valid passport to enter Denmark, but they don’t need a visa for tourist stays of less than three months. In addition, no entry visa is needed by citizens of EU and Scandinavian countries. Citizens of many African, South American, Asian and former Soviet bloc countries do require a visa.